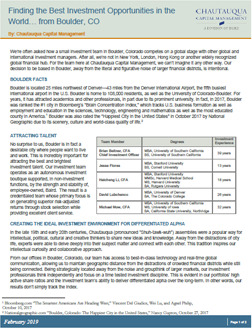 We are often asked how an investment team in Boulder, Colorado competes on a global stage with other global and international investment managers. After all, we're not in New York, London, Hong Kong or another widely recognized global financial hub. Our decision to be based in Boulder, away from the literal and figurative noise of larger financial districts, is intentional. Further, Boulder, Colorado is ideally equidistant from Europe and Asia. This allows for better business hours overlap with European and Asian markets than if we were based in New York City. Boulder is located in close proximity to one of the top 20 “busiest international airports” in the world: Denver International Airport. 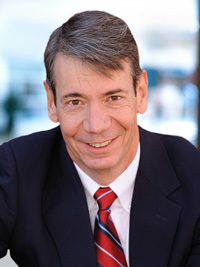 With the National Center for Atmospheric Research, the National Oceanic and Atmospheric Administration and the University of Colorado, Boulder has long had a high concentration of scientists. This, in part, has led to Boulder being ranked the #1 city in Bloomberg's "Brain Concentration Index“1. This index tracks U.S. business formation as well as employment and education in the sciences, technology, engineering and mathematics. Boulder has also ranked as the most educated county in America and was rated the "Happiest City in the United States" in October 2017 by National Geographic due to its scenery, culture and quality of life2. These attributes make it easy for us to attract and retain elite personnel. Being in Boulder also enables us to think independently, which is key to our ability to generate differentiated alpha. All-in-all, being in Boulder gives us an advantage. In the late 19th and early 20th centuries, Chautauqua (pronounced "Shuh-tawk-wuh") assemblies were a popular way for intellectual, political, cultural and creative thinkers to share new ideas and knowledge. Away from the distractions of city life, experts were able to delve deeply into their subject matter and connect with each other. This tradition inspires our intellectual curiosity and collaborative approach. From our offices in Boulder, Colorado, our team has access to best-in-class technology and real-time global communication, allowing us to maintain geographic distance from the distractions of crowded financial districts while still being connected. Being strategically located away from the noise and groupthink of larger markets, our investment professionals think independently and focus on a time tested investment discipline. This is evident in our portfolios' high active share ratios and the investment team's ability to deliver differentiated alpha over the long-term. In other words, our results don't simply track the index. The environment here is ideally suited for our fundamental approach to investing. We have a long-term investment horizon and manage concentrated, conviction-weighted, quality growth portfolios. We typically hold about 40 stocks in our global portfolio, and a subset of 30 non-US stocks in our international portfolio, with an average annual turnover rate of approximately 20%. Another way of saying this is that we hold stocks on average for 5 years. Based on this, investment team ratio is less than seven stocks per person over a five year period. When compared to the typical 100 plus stock portfolio that is turned over 100% per year our competitors would need more than 70 people to match our coverage. No firm has a 70 person team because small groups can work much more cohesively. Consequently, we are both able to have an understanding advantage and be more nimble to rapidly adjust to changing market conditions. We avoid the bias that results from analysts who are incentivized to sell ideas to portfolio managers. We avoid problems brought on by industry analyst's lack of full market perspective. We do not place too much reliance on a single "all knowing" portfolio manager. We have better team harmony because, at the end of the year, we all accept full credit and blame for everything. Continuity and succession risks go away when everyone is steeped in every holding and has mastery of the process. Chautauqua Capital's structure and investment process are designed to generate superior risk-adjusted returns through superior stock selection. Being based in Boulder, where we can think independently and attract the industry's best talent is an advantage. Past performance is not indicative of future results and diversification does not ensure a profit or protect against loss. All investments carry some level of risk, including loss of principal. Investments in international and emerging markets securities and ADRs include exposure to risks including currency fluctuations, foreign taxes and regulations, and the potential for illiquid markets and political instability. The Chautauqua Capital Management Strategies are available to institutions and persons with a minimum account asset value of $50,000,000, which is negotiable in certain instances. Investors should consider the investment objectives, risks, charges and expenses of each fund carefully before investing. This and other information is found in the prospectus and summary prospectus. For a prospectus or summary prospectus please click here or contact your Financial Advisor. Please read the prospectus or summary prospectus carefully before investing.